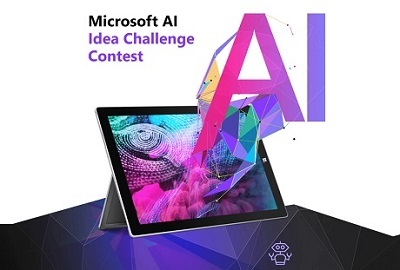 Microsoft is inviting AI researchers with ideas but no resources to submit their ideas to their Microsoft AI Idea Challenge Contest for a chance to win prizes and collaborate with other developers. The Microsoft AI Idea Challenge is directed at developers, students, professionals and data scientists seeking innovative, breakthrough artificial intelligence (AI) solutions. The contest also provides a platform for developers, students and data scientists community to freely share AI models and applications, so they are reusable and easily accessible. The Microsoft AI Idea Challenge is looking for AI solutions across all use cases. The top three ideas will each receive prizes plus an opportunity to present the idea with Microsoft on AI Lab. Ideas will be judged on originality, feasibility and complexity to implement. The first prize is a 15 inch Surface Book, the second a DJI Drone Mavic Pro Bundle and the 3rd and Xbox One. The Microsoft AI Challenge is accepting submissions between August 13th– October 12th, 2018. Individuals or teams are required to submit a working AI model, test dataset, any demo app and a demo video (max. three minutes long) to qualify for the competition. Preference will be given for solutions developed on Microsoft AI Platform and services. Read more about the contest at Microsoft here.